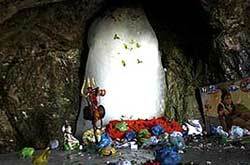 Jammu, June 20, 2013 - As per the Standard Operating Procedure (SOP) framed on the directions of Supreme Court of India, only 15000 registered Shri Amarnath Yatra pilgrims would be allowed beyond Pehlgam and Baltal in a day. For the On-Spot Registration, as well as convenience of the pilgrims, for their onward journey for the pilgrimage to Shri Amarnath Ji Yatra, three On-Spot Registration centres are being opened at Jammu Railway Station, Jammu Haat and Vaishno Dham. There would be no Registration centres at Pehlgam and Baltal this year. According to the Inspector General of Police, Jammu Zone, the decision not to have spot registration centres at Pehlgam and Baltal has been made taken to avoid rush of unregistered Pilgrims in anticipation to get on spot registration at Jammu and other base camps. It is further intimated that the on-spot registration will only be available for the dates when there are some vacancies. Thus the Pilgrims shall prefer to get registration from their respective areas and do not leave for yatra with the perception to go for on spot registration as it may cause large gathering at on spot registration centres besides this, the per day registration of Pilgrims should be made available on line so that the people can see registration status. The IG has advised all functionaries of various departments including Police, Traffic, Tourism department from Lakhanpur to Jammu to make the pilgrims aware through public announcements, Pamphlets, banners and display on LCD Screens that unregistered pilgrims would not be allowed to go for yatra and therefore, they should avoid such practices and the conditions, facilities available for Shri Amarnath Ji Yatra etc may be also covered properly.